To raise their exposure around increased service at Boston's Logan Airport, Jet Blue has signed a deal to become the official airline of Boston College Athletics. 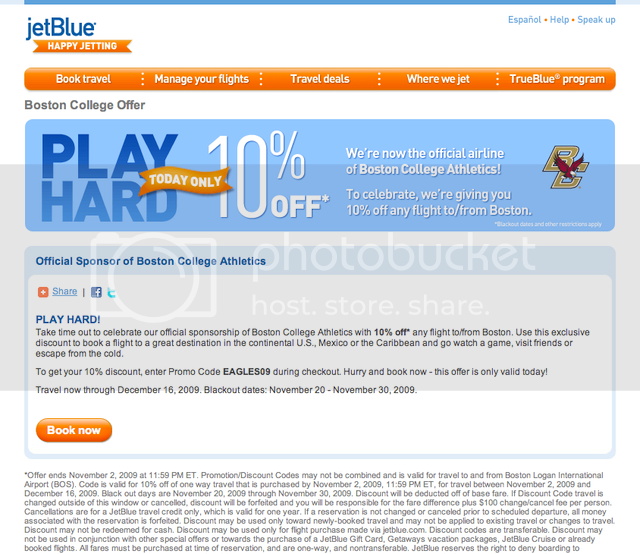 To celebrate the new deal, JetBlue is offering a 10 percent discount off all flights to or from Boston booked today at www.jetblue.com/bc. "As Boston's largest domestic carrier, it is fitting that we align ourselves with Boston College Athletics, one of the region's most prestigious sports brands," said Lisa Borromeo, manager of national sponsorships for JetBlue Airways. "This program presents JetBlue with a unique opportunity to establish an enduring connection with the school's legion of loyal fans and alumni and we are excited to harness Boston's passion for its sports teams to increase awareness of our award-winning service." JetBlue's sponsorship of the Eagles features fixed and electronic signage in Boston College athletic facilities including Alumni Stadium, home of Boston College football and Conte Forum, home of Boston College basketball and hockey. Additional sponsorship elements include on-field, on-court and on-ice promotions; a comprehensive online marketing program featuring rotating web banners and fixed advertising positions on bceagles.com; a branded email promotional campaign; and print advertisements in Boston College Athletic publications and in-game program guides. As part of the agreement, JetBlue will also partner with the Boston College Alumni Association and offer special rates for BC Reunion Weekend 2010. "We're thrilled to welcome JetBlue, the most creative and exciting brand in the airline industry, to the Boston College family as the official airline of Boston College Athletics," said Gene DeFilippo, Director of Athletics at BC. "This partnership is a homerun for Boston College, and we are excited to connect our loyal alumni, fans and supporters to the JetBlue experience." Fenway Sports Group assisted with the deal on behalf of Boston College Athletics.